It might not make up for R.I.P.D. (it's Men-in-Black ... with ghosts! ), but Hollywood has done something worthwhile lately. It's reduced our debt burden. Now, remember, it's not the size of our debt that matters. It's the size of our debt compared to our income -- our GDP. And even that really only matters insofar as lenders think it does. Semi-mythical bond vigilantes might revolt over higher debt levels, and demand higher interest rates. Or they might just be the bogeymen of James Carville's imagination. There are plenty of countries that have run up big debt-to-GDP ratios without paying more to borrow -- and sometimes less. That's what happens when the economy slumps, and there's a flight to safety. Japan, of course, has borrowed more than 200 percent of its GDP during its lost decade and a half, but its 10-year borrowing costs have tumbled to 0.73 percent. Now, higher debt levels are associated with lower growth, but, as Reinhart and Rogoff's L'Affaire Excel reminds us, it's only that -- an association. It isn't clear which way the causation runs. And no, there aren't any magic red debt lines either. 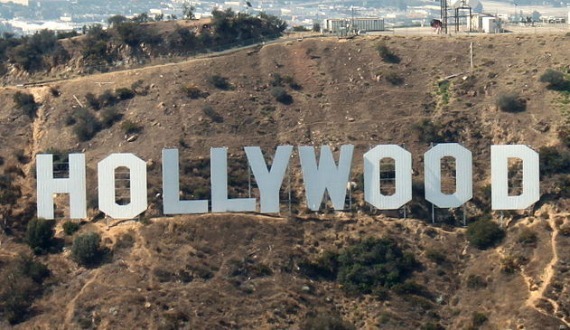 So what does this have to do with Hollywood? Well, the Bureau of Economic Analysis recently revised how it calculates GDP to include intangible things like R&D spending and movie or television royalties. Add it all up, and our GDP is actually 3 percent bigger than we previously thought it was. Woohoo. 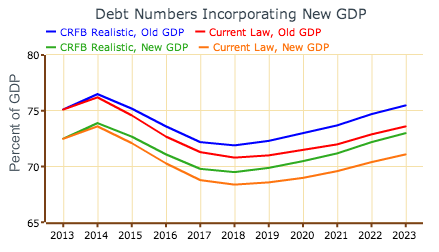 Of course, higher GDP means a lower debt-to-GDP ratio. As you can see in the chart below from the Committee for a Responsible Federal Budget, our debt burden is about 2.5 percentage points lower than we thought it was before -- 72.5, and not 75, percent. (Compare the red and orange lines). Who cares? No really, who cares? Markets certainly don't. It's not as if a little lower debt-to-GDP ratio has made us any more creditworthy. After all, our long-term budget outlook hasn't changed any. Our debt has just shifted down a bit. And that's kind of a profound point. Think about it in reverse. If a one-time downshift in our debt hasn't made us any more creditworthy, then a one-time upshift in our debt won't make us any less creditworthy either. And what's a one-time upshift in our debt? A stimulus. As Paul Krugman points out, the 2009 stimulus wasn't a temporary program that became permanent -- it faded away too soon and too fast. And a new stimulus would eventually fade away too. Okay, but would another couple percentage points of GDP of stimulus really matter? Yes, very much so. Krugman's back-of-the-envelope calculation is that filling the output gap would only add about 4 percentage points to our debt-to-GDP ratio -- while hopefully keeping the long-term unemployed from becoming unemployable, and making the investments we need today to keep growing tomorrow. Not bad for something that would only slightly increase our interest payments today, but not the market's fears of our fiscal tomorrow. For once, Hollywood isn't making a sequel. It's showing us that we should -- a new stimulus. That'd be waaay better than R.I.P.D. 2.